#1. This week's number one is former international power forward Steven Adams (213-93, college: Pittsburgh, currently plays in NBA). He led Oklahoma City Thunder to an easy victory against the Los Angeles Clippers (4-4) 128-110 in the NBA in Tuesday night's game. Adams had a double-double by scoring 18 points and getting 10 rebounds. He also added and 3 steals in 38 minutes on the court. The Oklahoma City Thunder has 3-4 record this season. It was his team's third consecutive victory in a row. But this is still an early stage of the season and everything may happen. It's Adams' sixth year with the team. Adams has individually a very good season with high stats. He averages: 13.2ppg, 11.8rpg, 1.3apg, 1.3bpg, 1.8spg, 2FGP: 51.7% and FT: 53.1% in six games he played so far. Adams played for the New Zealand senior national team seven years ago. #2. Second place goes to an international swingman Reuben Te Rangi (198-94, currently plays in Australia). He led Bullets to a victory over one of league's weakest teams Adelaide 36ers (2-5) 108-98 in the Australian NBL last Thursday. Te Rangi was MVP of the game. He recorded 29 points (!!!) and added 3 passes. Brisbane Bullets (3-3) are placed fourth in the NBL. But the season just started, so everything may happen. It's Te Rangi's first year with the team. 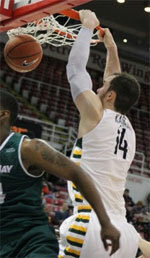 Te Rangi has relatively good stats this season: 15.0ppg, 3.2rpg, 1.5apg, 2FGP: 38.9%, 3FGP: 45.7%(16-35). He is in the roster of the New Zealand senior national team. #3. The New Zealand player who performed third best last week abroad was an international forward Finn Delany (198-95, college: SW Baptist, currently plays in Australia). Delany was the main contributor in a New Zealand Breakers' victory against one of league's weakest teams Adelaide 36ers (2-5) crushing them 114-94 in the Australian NBL on Sunday night. He was the best player in that game. Delany scored 27 points (!!!) and grabbed 5 rebounds in 20 minutes. New Zealand Breakers (2-2) are placed fifth in the NBL. But the season is still in it's first stage and everything can happen. This year Delany's overall stats are: 8.3ppg, 2.5rpg, 3FGP: 16.7% in four games. He is also a member of the New Zealand senior national team. #4. Guard Tai Jack Webster (193-95, college: Nebraska, currently plays in Turkey) could not help Galatasaray (1-2) in their last game on Saturday. Despite Webster's good performance the league leader Galatasaray was defeated 97-82 on the road by the lower-ranked Tofas (#3). He recorded 14 points, 4 rebounds and 6 assists. But there are still lots of games to play and it's a long way to go. It's Webster's first season with the team. This year Webster has relatively solid stats: 12.7ppg, 3.3rpg, 4.0apg and 1.3spg. He is also New Zealand national team player. #5. International forward Isaac Fotu (203-93, college: Hawaii, currently plays in Germany) was not able to help ratiopharm Ulm (0-4) in their last game. Despite Fotu's very good performance ratiopharm Ulm was edged 92-91 in Giessen by the much higher-ranked (#5) 46ers. He was the top scorer with 17 points. Fotu also added 7 rebounds in 26 minutes. So far ratiopharm Ulm lost all four games in the Regular Season. 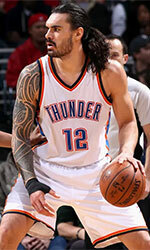 This year Fotu's total stats are: 9.0ppg, 6.5rpg and 1.8apg in four games. He has a dual citizenship: Tongan and New Zealand. Fotu plays currently for the New Zealand national team. #6. An experienced forward Mika Vukona (197-82, currently plays in Australia) is a teammate of previously mentioned Reuben Te Rangi and both played together in the last Australian NBL game. Vukona was the major contributor in Bullets' victory against one of league's weakest teams Adelaide 36ers (2-5) 108-98. He recorded 16 points and added 4 passes in a mere 16 minutes. Vukona has averaged so far 8.7ppg, 2.8rpg and 2.2apg in six games. He is an international player who is currently on the senior New Zealand National Team roster. #7. International guard Corey Webster (188-88, college: Lambuth, currently plays in Australia) is a teammate of previously mentioned Finn Delany and both played together in the last Australian NBL game. Webster contributed to an easy victory against one of league's weakest teams Adelaide 36ers (2-5) crushing them 114-94. He scored 16 points and grabbed 5 rebounds. Webster has reliable stats this season: 13.0ppg, 4.0rpg, 2.0apg and 1.3spg. He is also New Zealand national team player. #8. Forward Thomas Abercrombie (198-87, college: Washington St., currently plays in Australia) is a teammate of previously mentioned Finn Delany. He played also in the last Australian NBL game facing Corey Webster (above) in the other team. Abercrombie contributed to an easy victory against one of league's weakest teams Adelaide 36ers (2-5) crushing them 114-94. He scored 13 points and grabbed 4 rebounds in 25 minutes. Abercrombie's stats this year are: 10.3ppg and 4.3rpg in four games. He plays currently for the New Zealand national team. #9. U18 international forward Maxwell Darling (196-0, currently plays in Croatia) managed to help KK Vrijednosnice Osijek in a victory against the league outsider Bosco (0-4) 93-84 in the Croatian Premijer Liga last Saturday. He recorded only 4 points and had 3 steals in 18 minutes. KK Vrijednosnice Osijek (3-1) is placed third in the Premijer Liga. It was his team's third consecutive victory in a row. Darling has averaged so far 3.5ppg and 3.3rpg in four games. He is also in the roster of the New Zealand U18 national team. #10. Center Alex Pledger (215-87, college: Belm.Abbey, currently plays in Australia) contributed to United's victory against the closely-ranked Illawarra Hawks (2-3) 99-93 in the Australian NBL on Monday night. Pledger scored 7 points and grabbed 12 rebounds. Melbourne United (3-2) is placed third in the NBL. Pledger has averaged so far 7.6ppg and 6.4rpg. He is an international player who is currently on the senior New Zealand National Team roster. #11. International forward Robert Loe (211-91, college: St.Louis, currently plays in Australia) was not able to secure a victory for Cairns Taipans in their game against Kings in the Australian NBL. Loe scored 5 points and grabbed 6 rebounds in 19 minutes. His team lost 90-98. Loe has averaged so far 9.0ppg, 5.0rpg and 1.5apg in four games. He plays currently for the New Zealand national team. #12. International guard Jarrod Kenny (188-85, currently plays in Australia) is a teammate of previously mentioned Robert Loe and both played together in the last Australian NBL game. Kenny couldn't help Cairns Taipans in their game against Kings. He scored 5 points. His team were defeated 98-90. Kenny has averaged so far 3.3ppg and 2.3apg. He is also in the roster of the New Zealand national team. #13. International guard Shea Ili (184-92, currently plays in Australia) is a teammate of previously mentioned Finn Delany. He played also in the last Australian NBL game facing Thomas Abercrombie (above) in the other team. Ili contributed to an easy victory against one of league's weakest teams Adelaide 36ers crushing them 114-94. He scored only 2 points and added 7 assists in 22 minutes. 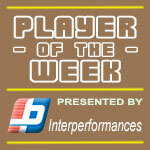 Ili has averaged so far 4.0ppg, 2.3rpg and 3.8apg in four games. He is also New Zealand national team player. #14. International power forward Tohi Smith-Milner (206-95, college: Polk State CC, currently plays in Australia) is a teammate of previously mentioned Alex Pledger. But that was another game of his team in Australian NBL which we would like to mention. Smith-Milner couldn't help United in their game against Perth Wildcats. He cannot count Saturday's game as one of the best ones. Smith-Milner scored only 3 points. His team was defeated 101-96. This season Smith-Milner averages just 2.6ppg. He plays currently for the New Zealand national team. #15. Former U19 international guard Joe Cook-Green (185, currently plays in NAIA) contributed to a 2-point Texas Wesleyan University's victory against the Louisiana State University-Shreveport 67-65 in the NAIA in Thursday night's game. He scored 5 points, had 8 rebounds and dished 4 assists in 26 minutes. It was his first game for Texas Wesleyan University this season. Cook-Green used to play for the New Zealand U19 national team three years ago. #1. Aron Baynes (208-C-86, college: Washington St., currently plays in NBA) contributed to a 3-point Boston Celtics' victory against the Detroit Pistons (4-3) 108-105 in the NBA on Tuesday night. He scored 9 points and grabbed 5 rebounds. The Boston Celtics have a solid 6-2 record this season. It was his team's fourth consecutive victory in a row. Baynes has reliable stats this season: 7.4ppg, 4.6rpg and 1.2apg. He has a dual citizenship: Australian and New Zealand. #2. Tony Tolovae (196-G-92, currently plays in Norway) led Gimle BBK to a victory against the closely-ranked Kongsberg (6-1) 93-82 in the Norwegian BLNO in Saturday night's game. Tolovae recorded 18 points and grabbed 6 rebounds. It was the game of the round between two top 4 ranked teams. Gimle BBK Bergen (8-0) is placed first in the BLNO. So far his team won all eight games in the Regular Season. Tolovae has individually a very good season with high stats. He averages: 15.4ppg, 5.8rpg, 2.8apg and 2.1spg. Tolovae is another player who holds two passports: Australian and New Zealand. #3. Matthew Wilson (200-F-92, currently plays in Spain) contributed to Betanzos' surprising victory against the third-ranked Gijon Basket (2-1) 97-90 in the Spanish EBA (fourth division) last Sunday. Wilson scored 11 points in only a mere 8 minutes. Santo Domingo Betanzos (1-2) is placed ninth in Group A-B. Wilson has averaged so far 9.0ppg and 2.3rpg in three games he played so far. #4. Isaac Miller-Jose (203-F, currently plays in Canada) contributed to a Manitoba University's victory against the Bobcats (1-1) 88-78 in the U Sports on Friday night. He recorded 6 points and grabbed 4 rebounds. The Manitoba University has 2-0 record this season. Miller-Jose has averaged so far 4.0ppg and 2.5rpg. #5. Carl Isitt (203-F, currently plays in NAIA) managed to help Central Methodist University to win against the Park University 78-70 in the NAIA last Thursday. He scored only 2 points. It was his first game for Central Methodist University this season. It was the game of the round between two top 2 ranked teams in group South. His team has record this season.